Leverage your stakeholder engagement and materiality processes to transform increasing risks into actionable, immediate priorities supported by strategy and data. CSR and sustainability reporting is fundamental to driving progress on your company’s material issues and delivering transparency to stakeholders. However, for many organizations,pulling the information together can be a real challenge. 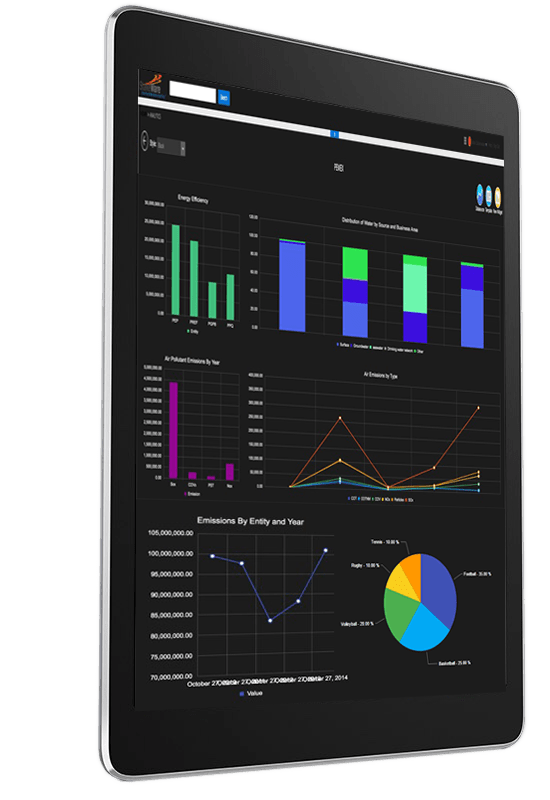 Using a robust, integrated system can transform the way you gather complex data, streamlining the reporting process and allowing you to direct more resources to strategy and innovation. Facilitate Reporting to Senior Management. Infuse users with data from any system, anywhere. Enable the company to get a common understanding of strategic issues and alignment on key performance indicators across multiple departments and business units. StakeWare places files where employees need them most — in project groups or attached to stakeholder records, KPI’s, or issues. Employees are more productive in the way they engage and innovate because they always have the files and information they need. Create an internal management system of sustainability projects and strategies, that can help you obtain organizationwide visibility of performance and actions. Analytics and Decision Support to Drive Improvements. Transform your sustainability data into a critical asset for the planning of corporate strategy by connecting analytics from your sustainability footprint into the business operations. Generate significant and meaningful data that is not just part of your sustainability report but it actually becomes part of your sourcing efforts, ecosystems development or even corporate communication. 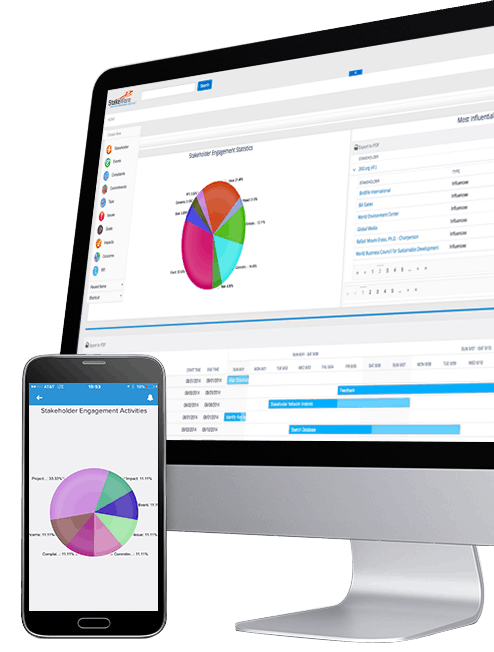 StakeWare Analytics makes it easy to act on your data. So once you find an answer, you can immediately take the next step and assign a task, close an incident, or collaborate with key stakeholders. Create a “living in the now experience ” by identifying hidden problems and resolving them quickly. CSR Reporting as Living Document for Compliance. 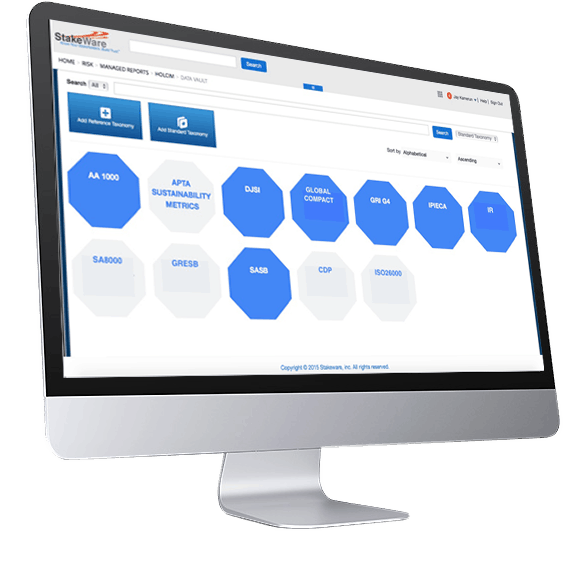 StakeWare’s Applicability tools enable professionals to plan and keep current their compliance programs. Built on the Force.com platform, these easy-to-use tools identify the requirements that impact specific sites, so facility managers know that they are complying with all applicable requirements, regulations, and permits. 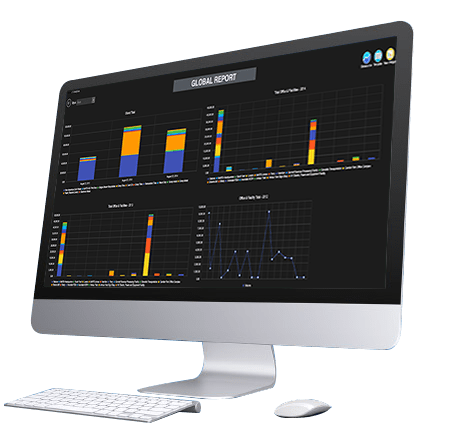 StakeWare Analytics makes it easy to connect right to your Stakeholder Cloud and Philanthropy Cloud data. So now you can dynamically explore any information to spot trends and visualize key performance indicators. Get answers and share findings from anywhere. StakeWare lets your whole team have a conversation around data, collaborate on answers, and present findings right from their phones. Powerful protection and controls ensure that your company’s data is always secure. So you and your entire team can confidently collaborate through every type of device. Consolidate your key performance metrics for simplified sustainability reporting. Avoid Survey Fatigue with Multi-Standard Platform. Native integration of sustainability standards: GRI G3 & G4, Global Compact, IPIECA, CDP, SASBI, Integrated Reporting, etc. Search for and review records and KPI’s. Use audit permissions to view their history – including user creation, modification and time-stamp information. Use an evidence based approach to ensure you always have the data you need. A full audit trail to support external assurance for your CSR reporting. A Target-setting and monitoring of progress system. 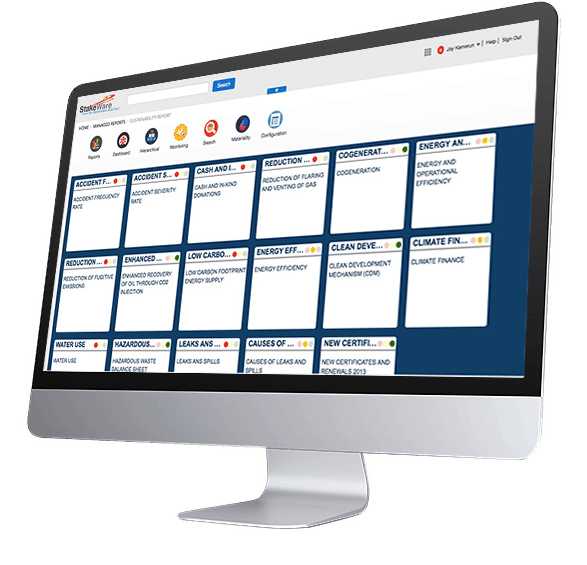 Completely flexible and customizable, the outcomes toolset provides the ability to create outcomes reports of any kind for any KPI. Use thresholds and notifications to monitor if a goal has been achieved or progress is being made toward the goal.